The sun was setting as my father and I rode to Castellina Chianti. We were fortunate to have found a cab with a driver who knew some basic English (since no transportation was provided where we got off the train). The landscape was breath-taking. I wanted to stop (almost everywhere) but the language barrier would have been too difficult. This image was my best aim out the window at 50 mph. 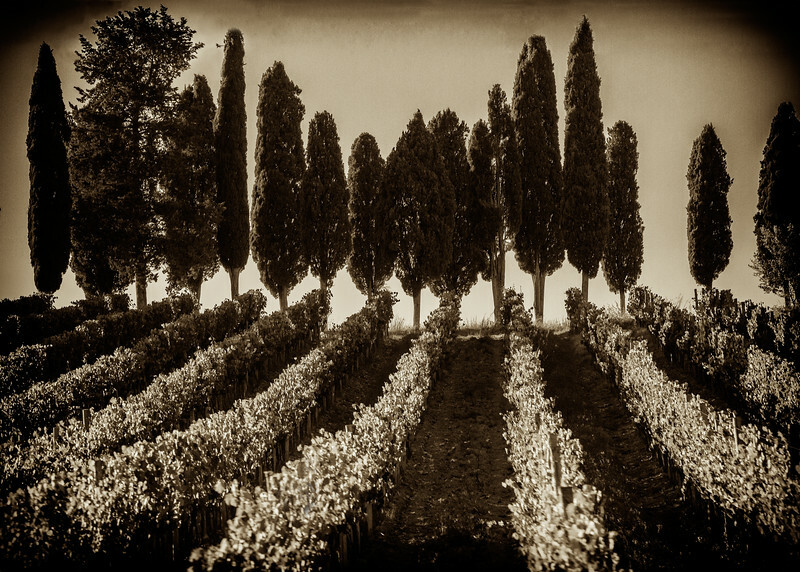 When you think of Tuscany, images of hills, grapes, olives and Cypress trees come to mind. Etruscan tribes imported the Cypress from Syria or Persia and considered the plant to have mystical significance. Cypress trees can survive up to 2,000 years or more. While the other deciduous trees lose their leaves in the winter, the cypress retained leaves, creating a supernatural impression for these early tribes-people.